Navigation? Probably less of a concern if you only walk in the summer on well established and marked trails. 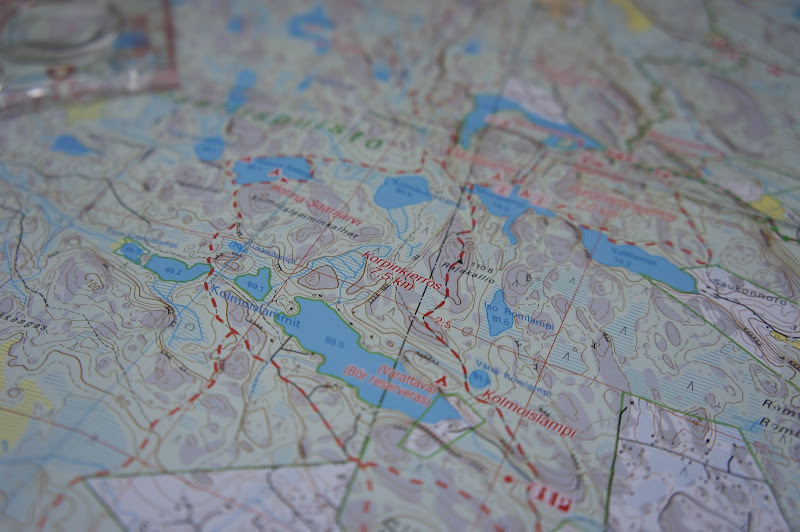 Go off-trail, add some inclement weather of choice - fog, a deluge, low clouds - and throw in some challenging landscape - dense forest, wide open tundra, vast bogs - and you'll want to carry a navigation tool of choice. And while GPS gadgetry have their place, I prefer compass and map. Before I went to become a Wilderness Guide, I seldom carried a compass. A map was sufficient for me, as I usually hiked on trails or if I went off-trail, I was sure enough of where I will end up. That changed as I started the education, and needed to navigate through dense forest at night, vast bogs in winter, and mountainous terrain in autumn. A compass became a useful, much needed tool. As I didn't want to throw my UL principles over board, I first used my Suunto Comet. That worked out just fine during day orienteering challenges, where I seldom even bothered using the compass - I find navigating solely by map a viable option during the daytime. Let there be a fine, wet, autumn night, in which you need to find five or more flags hidden in the forest, and I realized I needed a more substantial compass - one with a baseplate for ease of use with a map. 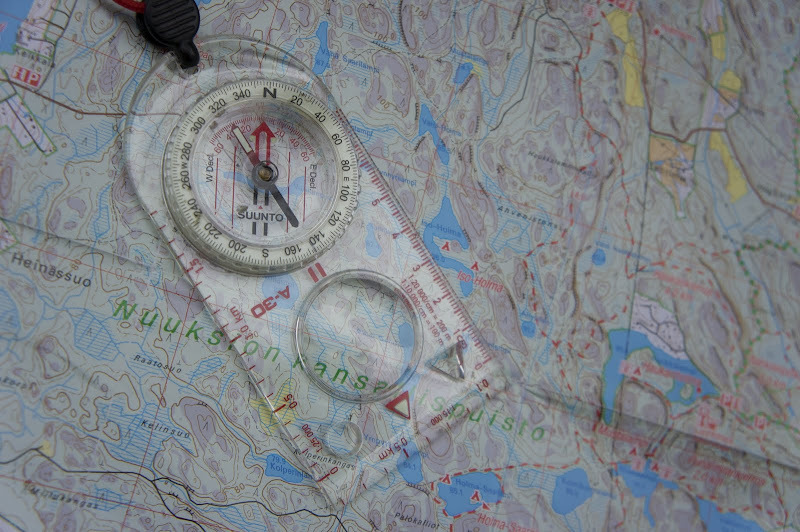 A look at the three leading firms when it comes to navigational tools, some chats, and a few days later I had three different compasses in the post, with the aim to see which is the best lightweight compass out there. They also all three point north! The Silva Ranger stands a bit out because my 2010 model didn't have a luminous bezel, only a tiny luminous marking on the needle, which made it less practical for night orienteering. Sure, I wear a headlamp at night, but the luminous bezel and markings do help as they're easier on the eyes if you want to take a quick look. The Recta & Suunto are fairly similar, although I do value the Suunto a tad more (call me biased, as Suunto is Finnish =). The little extra info on the Suunto on how many meters is a centimeter in a given scale is very useful if you need to calculate in your head how far you gotta go still; and in the heat of an night orienteering exam this kind of info might slip your mind. Both the Recta & Suunto have a clip-in lanyard, which allow you to quickly detach the compass from the cord, useful if you wear your compass around your neck but find taking a bearing with your nose just centimeters from the map a bit difficult. So after having used all three compasses for over a year, I nowadays tend to use the Sunnto A-30 if I head out and know I will go off-trail. Being the lightest with the for me best extra functions, that decision is easy. But how does the A-30 compare to the Comet and the Core watch? The Comet is fine if I don't go navigating at night. You can take a bearing with it, though it is fiddly and I have been heard swearing sometimes using it. The added thermometer and its minimal weight of only 11 gram make it a great multitool, and if I head out on the bike I carry the Comet on my pack to keep tabs on the direction. The Core is obviously in a league of its own. At 64 gram you get an Alti- & Barometer, a digital compass, and it also tells you the time, as well as sunrise & sunset and a whole bunch of other stuff. The compass works great, and thanks to the moveable, luminous bezel and the illuminated screen you also can use it at night. However, taking a bearing with it on a map goes in the "Be patient & don't swear" category, it [the compass] is also so sensitive that you need to stand still to get exact coordinates. In a pinch you can navigate at night with it, but a baseplate compass is a lot more practicable - the needle is less sensitive to movement. However, given the extra functions the Core brings along - I do like the thermometer and weather function - I often wear it when outdoors, especially since the iPhones battery isn't what I'd call long-lived. For those who're curious: I use an Ortlieb Document bag, Size A4, for keeping my map and documents dry. At 56 gram a great bag, and I rather have this than the Ziplock bag which I have used in the past - if I would know an easy source for waterproof paper, then that might replace the case, but until then it comes along. 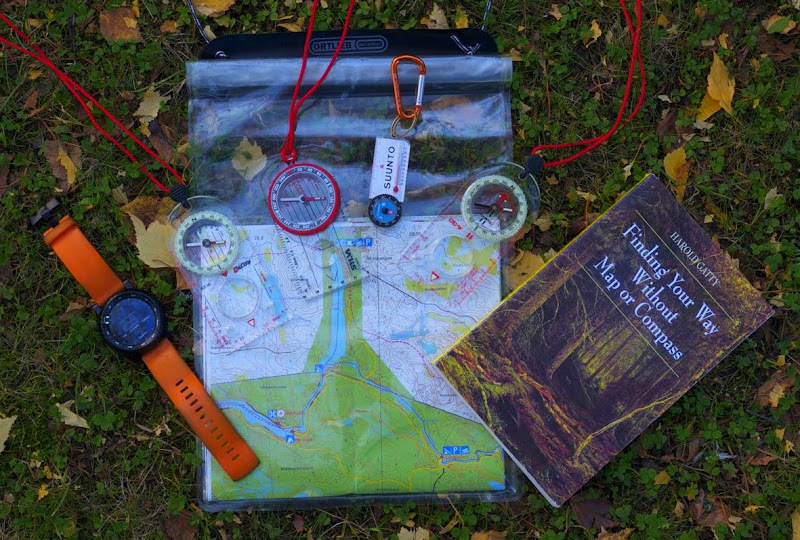 Finally, if talking navigation and orienteering I need to mention the Harold Gatty book "Finding Your Way Without Map or Compass" - it is THE book on the topic. Originally published in 1958, it is full of useful information on how to orienteer without extra gear, and just use skills and knowledge to find your way. Gatty goes in-depth and has a wealth of knowledge, and explains how to find your way in polar regions and deserts, over telling the time by the stars, to telling the directions from trees and to find your way in towns, this is the best literature on navigation, period. While one might think it is dated, the knowledge and skills he discloses are still as up-to-date as more modern books on the topic. Where to get the gear? Disclaimer: Untold riches will be poured over me if you purchase via the above Amazon links.